LOS ANGELES, Jan 17: Twenty-five years ago this week, a violent, pre-dawn earthquake shook Los Angeles from its sleep, and sunrise revealed widespread devastation, with dozens killed and $25 billion in damage. At 4:31 a.m. on Jan. 17, 1994, a hidden fault lurking under the city’s San Fernando Valley neighborhoods unleashed a magnitude 6.7 earthquake that shattered buildings, broke water mains and ignited fires. The so-called blind thrust fault — one with no surface features to reveal its presence — caused a block of earth to move upward. Most of the energy was released toward mountains that line the northern side of the valley, but there was more than enough energy sent in other directions to cause devastation . The ground shook horizontally and vertically for up to 10 seconds, most strongly in an area 30 miles (48 kilometers) in diameter around LA’s Northridge neighborhood, according to the public-private partnership Earthquake Country Alliance. It was felt as far away as Las Vegas. The state said at least 57 died in the earthquake, though a study issued the following year put the death toll at 72, including heart attacks. About 9,000 were injured. The greatest concentration of deaths occurred at the Northridge Meadows, a 163-unit apartment complex where 16 people were killed when it collapsed onto the parking area below, crushing first-floor apartments. The catastrophe at Northridge Meadows revealed a particular seismic hazard due to so-called soft-story construction in which a building’s ground level has large open areas for purposes such as parking spots or shop windows. 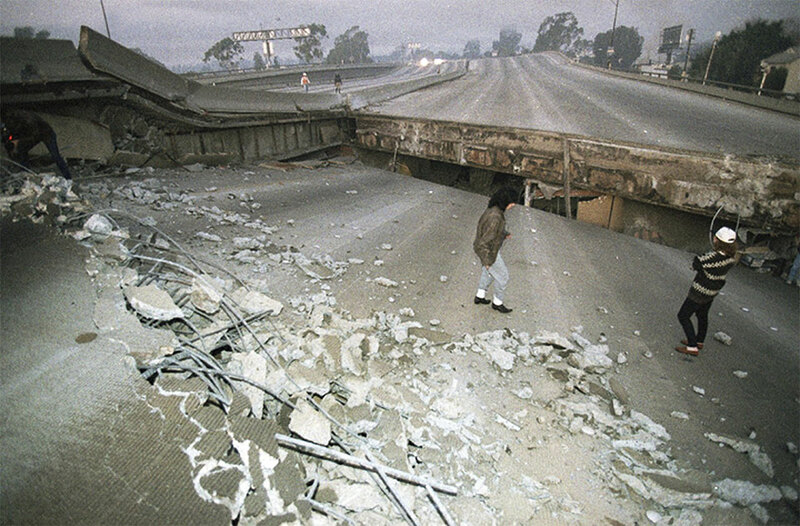 The widespread damage to buildings, freeways and infrastructure made the Northridge quake the costliest U.S. disaster at the time. According to Earthquake Country Alliance , 82,000 residential and commercial units and 5,400 mobile homes were damaged or destroyed, nine parking structures toppled, nine hospitals were evacuated due to structural or other problems, seven key freeway bridges collapsed, and hundreds more were damaged. Some 200 steel-frame high-rises sustained cracked welds. Vivid images from the quake included scenes of vehicles stranded high on an elevated section of freeway with the road fallen away in front and behind, and the wrecked motorcycle of a police officer who plunged to his death off the end of a broken overpass while rushing to work in the early morning darkness. The California Department of Transportation, which had already retrofitted many of the bridges that ended up being damaged, would spend hundreds of millions of dollars to further strengthen numerous bridges identified as being at risk. The damage to hospitals led the state to require strengthening of those buildings. Since Northridge there has been a push toward progress — sometimes frustratingly slow — on everything from making buildings safer to increasing society’s overall ability to deal with seismic threats. In 2008, an annual earthquake drill known as the Great ShakeOut began in Southern California to teach the basic safety technique of “drop, cover and hold on.” Initially based on a scenario of a magnitude 7.8 quake on the southern end of the mighty San Andreas fault, the drill has since spread across the United States and around the world. In 2015, Los Angeles enacted a mandatory retrofit ordinance aimed at preventing loss of life in major earthquakes at the city’s most vulnerable buildings. It covered about 13,500 “soft-story” buildings like Northridge Meadows and some 1,500 buildings with “non-ductile reinforced concrete” construction. The ordinance, however, allowed a process spanning seven years for retrofitting of soft-story buildings and 25 years for non-ductile reinforced concrete buildings. Last year, the U.S. Geological Survey announced its fledgling West Coast earthquake early warning system was ready for broad use by businesses, utilities, transportation systems and schools after years of development and testing of prototypes. The system detects the start of an earthquake and sends alerts that can give warnings ranging from several seconds to a minute before shaking arrives, depending on distance from the epicenter. That can be enough time to slow trains, stop industrial processes and allow students to scramble under desks. This month, Los Angeles Mayor Eric Garcetti unveiled a mobile app that uses the early warning system to alert Los Angeles County residents when there is an earthquake of magnitude 5.0 or greater. Other mobile apps are in development. Also this month, the Los Angeles Economic Development Corp. released a guide aimed at helping businesses minimize disruptions from major earthquakes, taking advantage of information technologies such as the digital cloud to keep a company working even if its physical systems are destroyed or inaccessible.